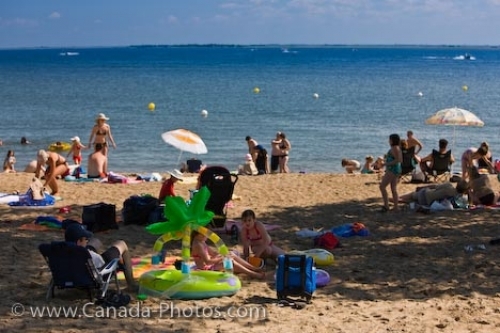 During the summer months, people flock to the sandy beach along Last Mountain Lake in Rowan's Ravine Provincial Park in the Qu'Appelle Valley in Saskatchewan, Canada to enjoy their vacation. Last Mountain Lake is approximately 70 kilometers long and 40 meters deep where an assortment of outdoor activities take place every summer. The campgrounds run alongside the lake which supply firewood, showers and playground with your camping fees. People enjoy swimming, tanning, beach volleyball, frisbee, fishing, boating and other fun summer time things on the beach and on the lake while other visitors explore the attractions nearby. The Last Mountain Historic Park, the National Wildlife Area, the Bird Observatory, the Foothills Bison Ranch, the Valeport Marsh and the Strasbourg and District Museum are a short list of them. Picture of crowds of people enjoying their vacation at Last Mountain Lake in Rowans Ravine Provincial Park in Saskatchewan.